Our Guest Blogger series returns this week after a 3-month hiatus for the Celebrate Christmas Quilt-Along. I’m now booking guests for March, find out how you can be a guest blogger here. Please join me in welcoming quilter Bea Lee as today’s guest. My name is Bea Lee and I LOVE LOVE LOVE to quilt! I’m grateful that Michele has let me be a guest blogger here. I’m originally from Denmark- Born and raised, moved to Florida when I was 18 to go to college then met my husband etc… that was 15 years ago (OOPS I just gave away my age, didn’t I?) Now we live in the STICKS of North Carolina and have 2 great kids. I wanted to tell you about how I got started with this OBSESSION – quilting. 7 ½ yrs ago I was pregnant with our 2nd child – a girl, and my church had a quilting class over the summer for a few evenings, taught by a pastor’s wife, so I figured I’d try it out and see if I liked it. I actually have a degree in computer animation – my goal was to work for Disney, but while I was in college I met my husband and I also soon after that got saved, so my view on life totally changed…. My daughter's quilt - first one I made. I remember at the end of the class we were asked if we’d get into quilting and I said, NAH not really…. Oh boy, was I wrong, and I’ve apologized to her several times for saying that. I slowly got more and more into quilting, a few years later we moved into the country and I got my own craft room, WOW!! PLUS, some of my neighbors quilted – really inspiring. Then I started submitting a few quilts to the local county fair, I think I brought in 4 quilts and got 4 ribbons, I was thrilled. That Fall, my husband was looking at my quilting magazines and asked me if I wanted a long arm machine, because he could tell I really liked it – well SURE!! So he researched it and a month or so later I got my Hinterberg setup, a Voyager machine and a Summit frame. 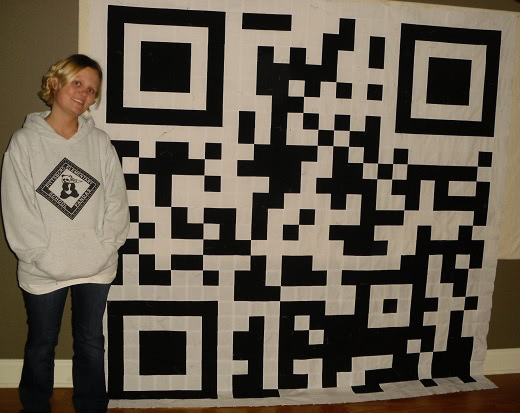 A barcode quilt I'm making for my husband (got the idea from a Radio Shack ad/competition - it links to Radio Shack!). Now I also long arm quilt for customers, I love doing that too! I love every part of quilting: designing in EQ7, buying fabrics, cutting, piecing, applique – needle turn or machine, long arm quilting, adding on the binding and label. My least favorite part of a quilt is maybe the border! Piecing a long strip for the border is just BORING…. I make lots of small quilts and love giving them away, either to expecting mothers or babies or others who needs them. A bunch of owls I've made and sold/ given away. I also make quilts that I would like (one day) to get published, where I designed the patterns and have written up patterns for a few already. If anyone would like to be a TESTER for me, let me know. 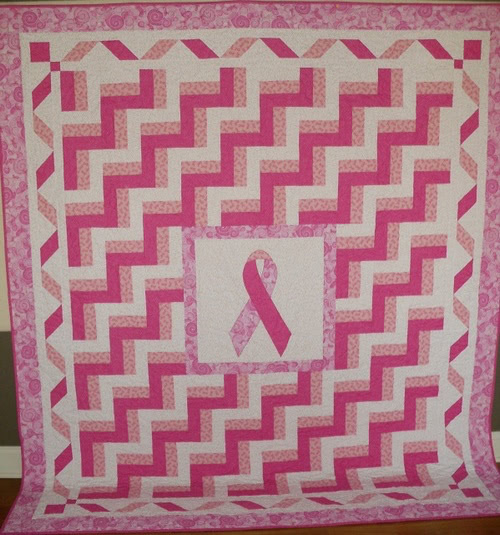 A Pink ribbon quilt for my best friend in Denmark who has breast cancer and is going thru chemo now, I'm mailing her this quilt for Christmas. I’ve also taught a few quilt classes, some at a local quilt store and recently at the local college. I also try to make quilts for shows, and have won a few ribbons already :-) one was at an international quilt show in Washington State a few years ago, called BARGELLO MIRAGE. I’ve mentioned already I won a few ribbons at the local county fair, and last month I won two ribbons at a county quilt guild show, I missed the submission date for the state fair this year, I’ll try next year. Don’t get me wrong, of course I love to win ribbons, but it’s not my main focus in quilting. What I truly love is giving them away. I feel God gave me this gift and I want to Bless back with my quilting in different ways. I love to BLOG about my quilting projects. And I love to get inspired by other quilters too. Until Dec 18th, there’s a great give away from Electric Quilt. Have a look. I also have a web site. If you have any comments I’d love to hear from you via my blog or web site or email. 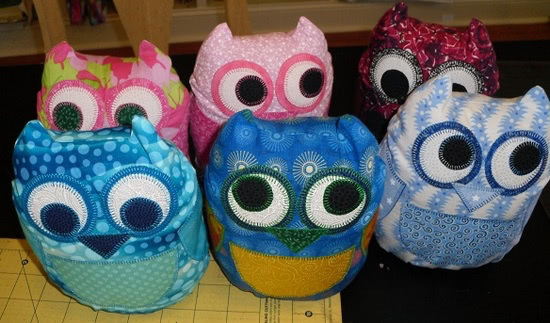 Great quilts and love your owls! I must commend your learning spirit. The way you learned quilting and transformed it into a skillful art of yours is really amazing. It is true learning is an ongoing process and sometimes it gets transformed into things that we have not thought of. i love your breast cancer quilt its lovely would love to be able to get this pattern if you do get them published. My granddaughters has neurofibromitosis (NF) we have been looking for a ribbon pattern. 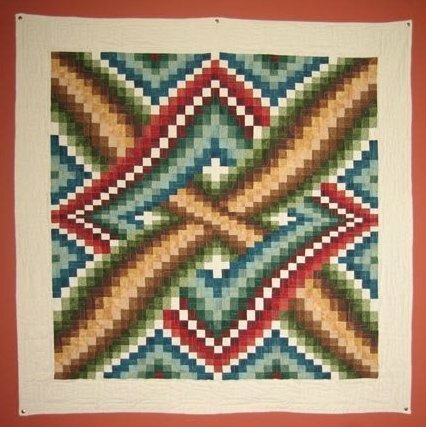 I love this quilt,I was wondering if you could tell me where I can get the pattern. Thank you so much!